This year we harvested some cork from our forest for the first time. Cork is widely regarded as one of the most ecological and sustainable materials available. Here in the Alentejo region of Portugal (the epicentre of global cork supply), it is part of a rural tradition going back hundreds of years, that is revered as a success story in terms of balanced human economic activity in a semi-natural landscape. Around here there is much pride in being a cork cutter, a highly skilled and tough job that requires long apprenticeship with a master. 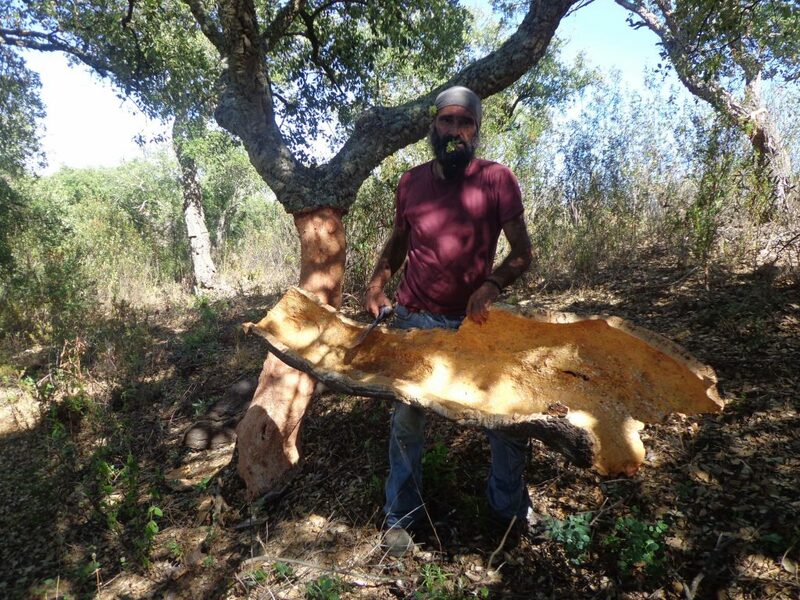 However in recent years there has been widespread cork tree die-off, a fungal disease has attacked trees. The causes seem to be various factors that have reduced the immunity and resilience of the trees; an obvious one being the changing climate, with hotter, longer summers, increased aridity, and heavier bursts of rain. On top of this, the popular practise of ploughing the land between the trees in order to keep it ‘clean’, not only means that the soil dries out and then washes away with the first rains, but also does immense damage to the shallow roots of the trees and the mycorrhizal network that connects them into a living web of communication and support. When assessing whether a forest activity is extractive, sustainable or regenerative things are not simply black and white, and it depends on the approach taken, and the relationship to the forest. We need to keep questioning our measures of sustainability and adapt to new conditions, in order to maintain living forests. 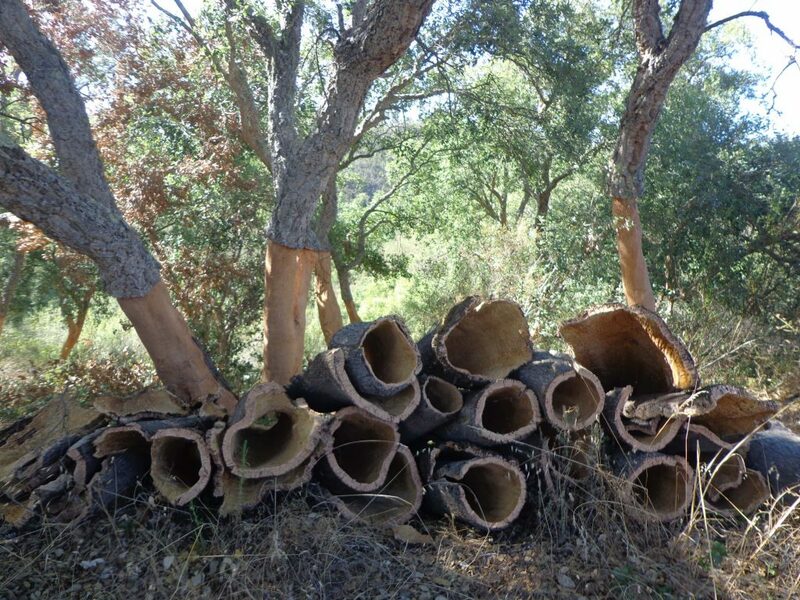 We are asking ourselves if there a way of harvesting cork that is truly regenerative? That puts the health and biodiversity of the forest first, whilst also offering an income to forest owners to help them steward the forest, and preserving rural livelihoods and culture. The key to the survival and regeneration of forests is not to create vast conservation zones that prohibit all human activity, this approach also places the human being “outside” of nature, and it is this disconnection that has led us to be so destructive. It is by stepping into our place within the ecosystem that we can re-learn and discover how to behave in a way that allows us to happily co-exist with all the other life within it. Here it can be useful to learn from our ancestors. I am currently reading the book Tending the Wild: Native American Knowledge and the Management of California’s Natural Resources. Like other indigenous peoples, for the Native Americans (before the settlers arrived) there was no separate idea of “wilderness”. People were embedded in place and their practices were in harmony with the natural world. At Monte de Vida we have been inquiring and discovering our place as humans within nature, what our role is here, and how our relationships with the other life around us can create a beneficial symbiosis for us all. We do not have all the answers yet. It is a living inquiry that will evolve, as we evolve in our skills of communication with the nature around us, and learn a deeper trust in the information we receive. When we considered harvesting cork last year we got a clear “NO” from the trees. We felt it would stress them too much, and later I was glad we listened as it turned out to be a particularly hot, long, dry summer. This year was different, we had a very wet spring and summer came very late, it was cool right up until we harvested in July, and plenty of moisture still in the ground. 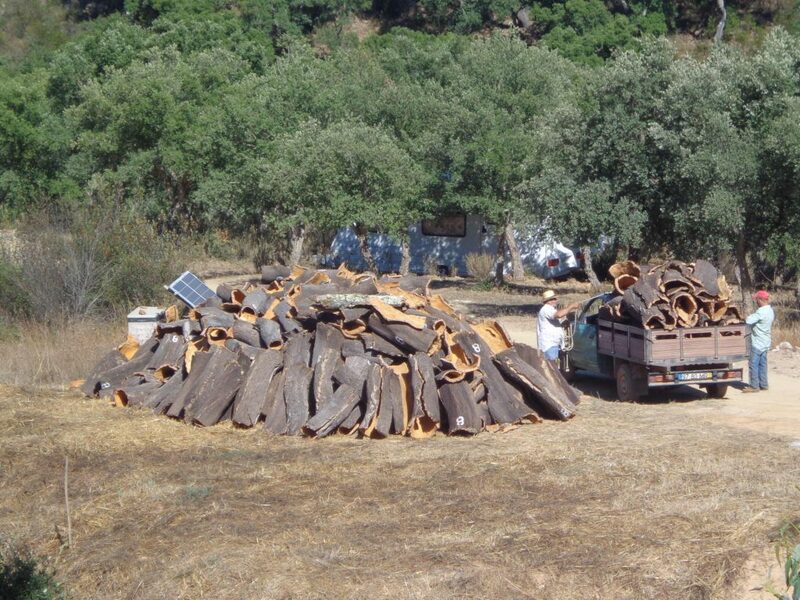 Harvesting cork in a balanced way respects the particular location and condition of the forest. In our location, trees on the top part of the steep slope, that receive the most sun exposure show more stress, and so we decided to leave them. Their role in this piece of forest was to protect and shade the trees below. We also left any tree that was not healthy, and any ‘special’ trees, those we feel are the mother trees, whose role is to nurture the trees around them, to produce plenty of acorns and act as connectors and communicators between us and the forest. We learned from the older cork cutters that a good cork harvester will remove the cork only when the tree “offers it”. It should come away relatively easily, without a fight, otherwise the tree wants to keep its cork jacket. It is wise also to not cut too high, and to cut with care so as not to damage the cambium layer. These principles are not always respected, and there are plenty of examples of trees that have suffered damage from careless or greedy harvesting. These are examples of an extractive forest economy that puts short term gain over long term health. The company LUSH has been exploring the idea of ‘Regenerative Cork’ together with our friends at Eco Interventions, their company Cork Connections Lda, and some other forest projects in our region. The cork for their new soap boxes is being sourced from forests under regenerative management, where there is no use of heavy machinery or ploughing, but instead a focus on increasing biodiversity and forest resilience. 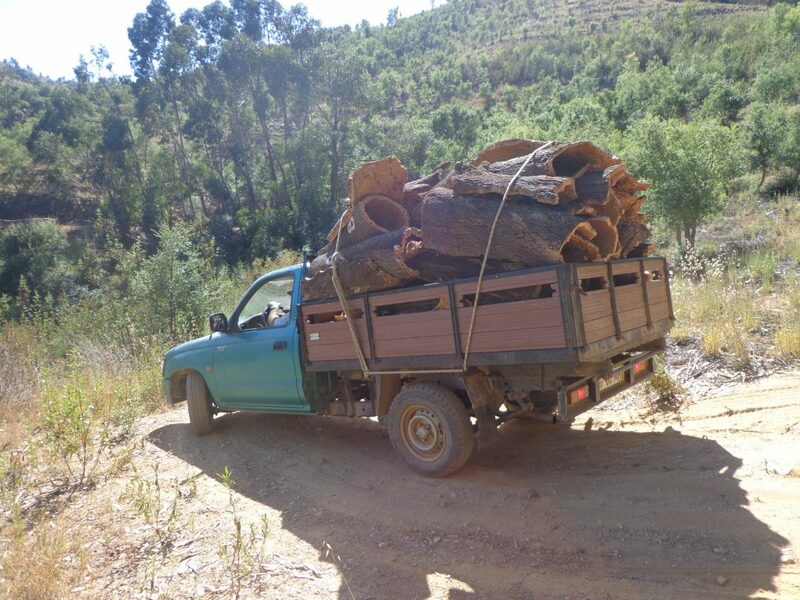 We planned to sell our cork into this supply chain, although when the cork buyer came to see our pile we discovered that it is mostly not suitable for making the soap boxes due to the trees being too strong and healthy, and at an age of peak growth! The cork has grown so quickly over the past 10 years that cracks have formed in its structure making it less valuable. Of course we are happy that the tress show signs of vigorous good health. We are told that the next harvest in 9 or 10 years time will most likely be of a more dense and uniform quality as the growth will have slowed down. 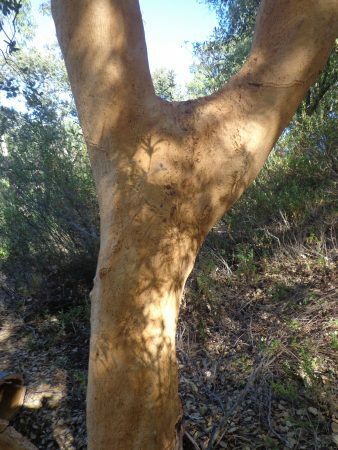 However this connection between tree health and the quality of the cork, may also mean that if the tree is put under more stress by more aggressive cutting, it will slow down growth, thus producing higher grade, more valuable cork. This would most likely lead to a bigger income from the tree over its lifetime, but a shorter lifespan. We feel happy to have participated in this activity which is so central to the local economy and culture, and that is certainly a much more positive forest economy than the eucalyptus monocultures. We will keep observing and learning, and see how the forest thrives after the harvest before deciding to cut further areas in the coming years.